Challenge #3- "Bling It On" create a project using shine, jewels, glitter etc.. I used glitter on the butterfly and the flowers. I used pearls down the center of the butterfly. 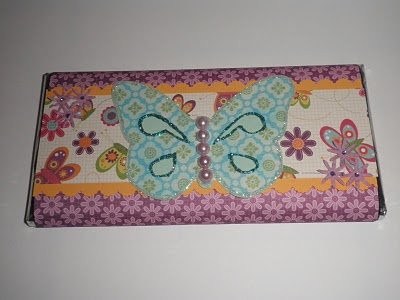 The butterfly is from Stamping Solutions. This is wrapped around a large hershey bar. Great way to decorate those plain hershey bars and give them as gifts for thank you's or easter or whatever! Baby Shower Favor's - Done!